With A New York Times Best Selling Author? If you're an aspiring or experienced author, a short story writer or someone with an awesome imagination, then you need to read this..
A few years ago Amazon.Com changed the Publishing Industry forever with the launch of it's now flagship product the Amazon Kindle. Since that time there has been an explosion of content available from authors writing in almost every genre known to man. Is there a difference? Yes! there is a massive difference a kindle best seller sells approximately 5,000 copies per month, but a New York Times Best Selling Book can sell over 150,000 copies in print and digital in the same 30-Day time period. That's about $350,000 difference in Royalties! - Correction - That's a Humongous Difference! How Can You Become A New York Times Best Seller? The Answer is Simple - Partner With Another Best Selling Author! By co-authoring with another bon-a-fide best selling author you gain access to an existing reading audience, bookstore clout, retailer influence and an author platform that would take you years to build! This strategy is used by big publishing companies - and now you have the opportunity to do this. Your next title could bring in a five figure check! When you contact a Book store for a book signing do they jump at the chance of having you in their store?, or when you contact a book blog for a tour are they excited to hear your voice? Will the Apple iBookstore, Amazon and Barnes & Noble Merchandising Departments promptly return your call? - If the answer is NO to those three queries then... You need this! Alongside a NYT Best Selling Author as your coach, mentor, co-author and partner - you can become the next rising star author. Over $5000.00 in Bonuses FREE to ALL NYT Best-Seller Partners. It's a No Brainer - that's why! First, for the last four years Wahida's books have hit the New York Times Best Selling list pulling in over 100,000 plus in unit sales each. Secondly - as Wahida expands her brand into other genres your book might be the Breakout Title that sells over 250,000 copies in the first year. Last But Not Least : You can earn a FULL TIME INCOME for a year or TWO! - Because Royalties are Split Down The Middle! So here's what you need to do Next! #1: Sign Up Using The Add To Cart Button And Make Your Good Faith Payment. #5: Schedule a meeting time with Wahida and her Team. #6: Hang On and Enjoy The Ride! Don't Wait Get Started Now! You Don't Need To Have A Manuscript Yet - Work with Wahida's Team to select one of her existing manuscripts in the fiction romance niche. You will be working directly with Wahida and her Editorial Team to edit, format and publish your book. 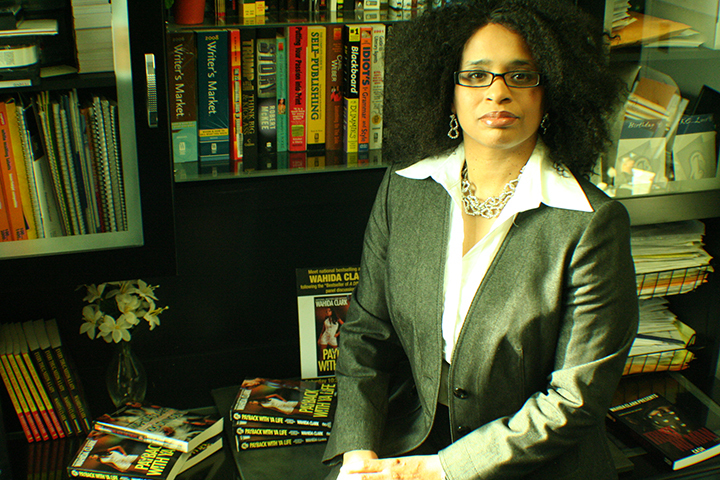 Wahida Clark will be listed as the Co-Author on your Book - Now the sky is the limit. Fiction and Non-Fiction titles Wahida will work with either. Your $99 Payment is a good faith payment and you will be interviewed by Wahida - if we can work together then awesome if not your payment is immediately refunded. You need to be available for Blog Tours and In Bookstore signings if and when the time comes to attend with Wahida. FINALLY - Be committed - Wahida knows what it takes to become a best seller and if you work with her the sky is the limit! For ONLY $99.00 - You Can Apply NOW! Your Application Fee is Fully Refundable! Let's Create the Next Best Seller Together!